Since her first photography class, taken as a journalism student in 2000, Kerri Martin has enjoyed both the quiet comfort and intense creativity of seeing the world through the lens of a camera. 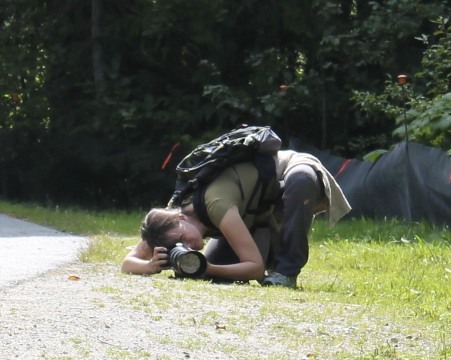 A focus on nature and wildlife photography over the past eight years has driven Kerri to reconnect to the child-like joy of observing the miracle of our natural world. She considers herself lucky to live in Calgary, Alberta, close to some of the most diversified environments in the world. From the stark, desert-like climate of the east to the lush forests of the west, the landscape of Alberta is as varied and unique as its animal (and human) inhabitants. Kerri has taught wildlife photography for Mount Royal University’s Continuing Education Program, presented for World Animal Day events and various Camera Clubs and had photo exhibitions at the Human 360 Clinic and Essentia Organic Mattress Store. A passionate animal-lover, writer and photographer, Kerri’s goal is to inspire people to connect to our natural world from a place of deep respect and appreciation. She believes grounding ourselves within the intricate yet simplistic beauty of our non-human counterparts allows us to see our true place within the larger structure of biodiversity. Kerri believes connecting to our natural environment encourages more compassionate human behaviour. Kerri is pursuing a Master’s Degree in Visual Communications with a focus on photography, and plans to delve further into understanding and learning about the art of wildlife and nature photography. I believe there is a fine balance between appreciation and disturbance when it comes to wildlife. When photographing and observing wildlife, it is always my goal to have as little impact as possible. This means not interfering with an animal’s natural behaviour – I do not practice baiting and try not to scare or stress out the animal by prompting it to look up/run/fly, etc. Keeping a safe distance and being aware of signs of stress is important. It is easy to slip up, to let the excitement of seeing beautiful creatures over-ride my common sense. I suspect even the most seasoned photographers would admit to making mistakes on occasion. But the key is to be vigilant – to always evaluate my actions in every encounter. If I can leave an animal knowing I had as little impact as possible, I am a one happy camper. If I make a mistake, I need to strive do better next time. I hope you enjoy my site and feel free to contact me with any comments or questions. © 2019 Kerri Martin Photography.